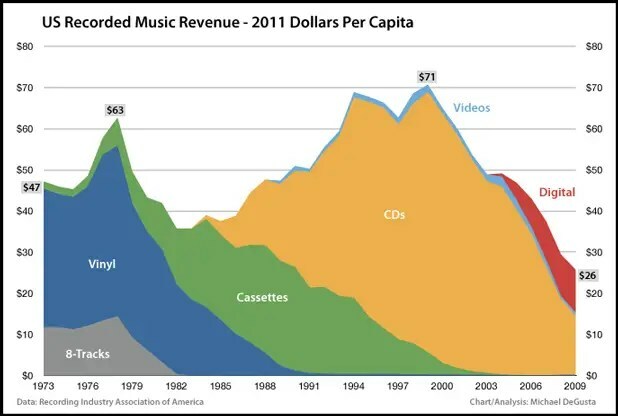 Obviously the recorded music biz has a significant decline in total $ of sales since it’s peak around 1999-2000. 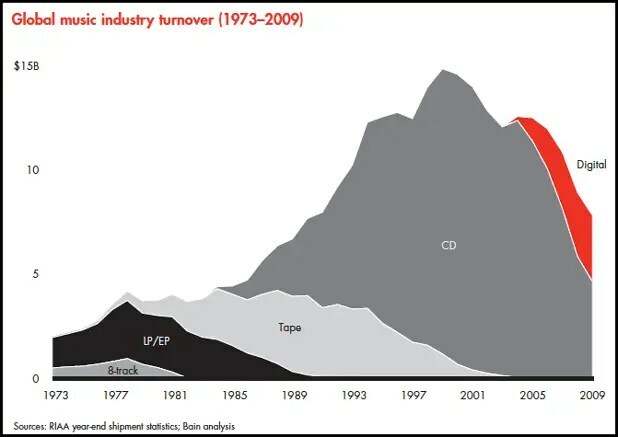 But, then the industry had quite a run there from 1986-2000. So what do you think accounts for the decline in sales, especially the decline since 2005? Um, a whole lot of discretionary spending has tanked since 2006. We had a Great Recession, recorded music is actually kind of a luxury and not essential and the only people with rising incomes are the Wall St types and they don’t listen to that much music. Well, most of the new music is crap that doesn’t sound that good thanks to all the new fangled processing – certainly not as good as the old days when the world’s greatest rock-n-roll band recorded on vinyl. It’s not really a good business practice or sound marketing strategy to be suing your customers all the time for alleged copyright infringement. Wasn’t 2001 when Michael Jackson’s last album came out? Bieber just can’t compare. SO what’s the correct answer? Well it helps to dive a little deeper (see the full article here: http://www.businessinsider.com/these-charts-explain-the-real-death-of-the-music-industry-2011-2#ixzz1FOmV58XD) But essentially it seems that the biggest culprit is the switch to digital formats, but not because of any piracy issues. Instead digital formats (iTunes, MP3 sales) has had the effect of switching sales away from albums and towards singles-only. Turns out the industry in the past was built on a model of sell a bundle (the album) of mixed stuff. The one or two songs the people wanted with a lot of crap they didn’t. In digital world, there’s no need to bundle. Consumers just buy the one song they want and don’t end up buying the other songs on the album. Result: huge volume drop for the record labels. Of course, personally, I think it’s still a lot #3 above. Museum of the Middle Class? The Onion was trying to be funny when they published this article back in 2004. I’m not so sure it’s so absurd any more. Maybe we could use a “museum of the middle class”. SCHAUMBURG, IL—The Museum of the Middle Class, featuring historical and anthropological exhibits addressing the socioeconomic category that once existed between the upper and lower classes, opened to the public Monday. Read the whole article at The Onion. One can debate the political pros and cons of President Obama’s proposed budget: Jonathan Chait does an excellent job here debating with — himself! But in fact there is a quite simple way to reduce federal spending by $47 billion a year as a conservative estimate: that old public health care option. Such things, however, cannot be discussed in polite company, so let’s just reduce Pell Grants, maternal and child health, and food safety inspections instead. Whew! Glad we dodged that bullet.